Zaijian Jaranilla, mostly known as Santino, went viral as his photos storms the social media because of his very mature and handsome photos. His role as Santino in ABS-CBN Teleserye in 2009 "May Bukas Pa" made him quite popular among people by sharing the ideals of kindness and truthfulness. He also had been part of the popular kid's show on ABS-CBN network "Goin' Bulilit." He charmed a lot of netizens' hearts with his very sophisticated grown-up photos which been shared by Student Secret Files' Facebook page. "NGAYON NALANG ULIT AKO KINILIG NG GANITOOOO APAKAPOGI!!!!" "nkakainlove talaga yung mga lalaking makapal kilay" "kapag may js talaga sa school sya na lang rentahan ko one day lang oy HAHAHAHAHAH"
"found a new artista na ilalagay sa crushlist ko"
At the very young age of 5, Zaijian's parents have been separated. He was the eldest of the three siblings of the Jaranilla children. His younger brother, Zymic Jaranilla, is also a sensational child actor that works for the GMA network. 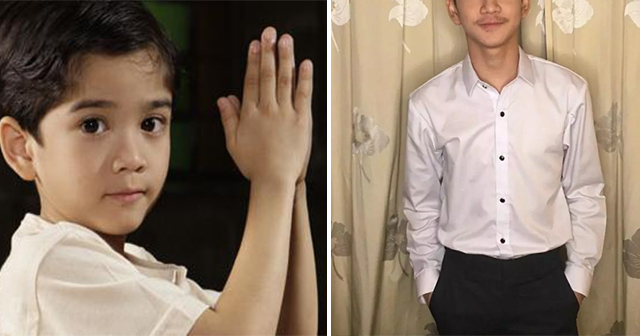 Zaijan played a lot of roles in his childhood years as a very innocent child. He landed a role in the Teleserye "Hawak Kamay" which is led by famous artists such as Iza Calzado, Piolo Pascual, Xyriel Manabat and Andrea Brillantes. What are your thoughts about Zaijian's photos? Isn't he so regal in those photos? Share your thoughts with this article!